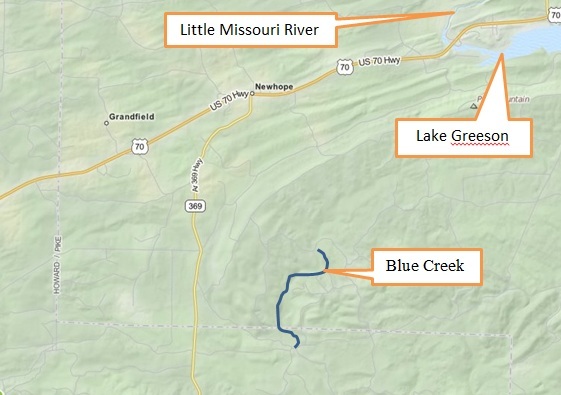 In the Lake Greeson Wildlife Management Area located south of New Hope in Pike County you will find a moderately steep creek that offers a unique paddling experience, the Class II-II+ Blue Creek. This two mile section of the creek is shallow and swift, but is not particularly demanding of your paddling skills. Flume is a good word to describe the general nature of the creek. With the water depth at the put-in bridge between 18″ and 24″ (downstream side of bridge), you will be able to skim over most of the rocks. There is quite a bit of brush growing in the channel, but a clear route can be found through all the grown up areas. Quick maneuvering is called for, but the penalty for mistakes is not significant in most cases. There are brief pools after the lengthy swift sections which are NUMEROUS. To reach the take-out, follow highway 369 south out of New Hope for 3.8 miles and turn east on road 24000. There is a gate at this entrance to the AGFC Lake Greeson Wildlife Management Area, but it has been open every time I have been in the area. 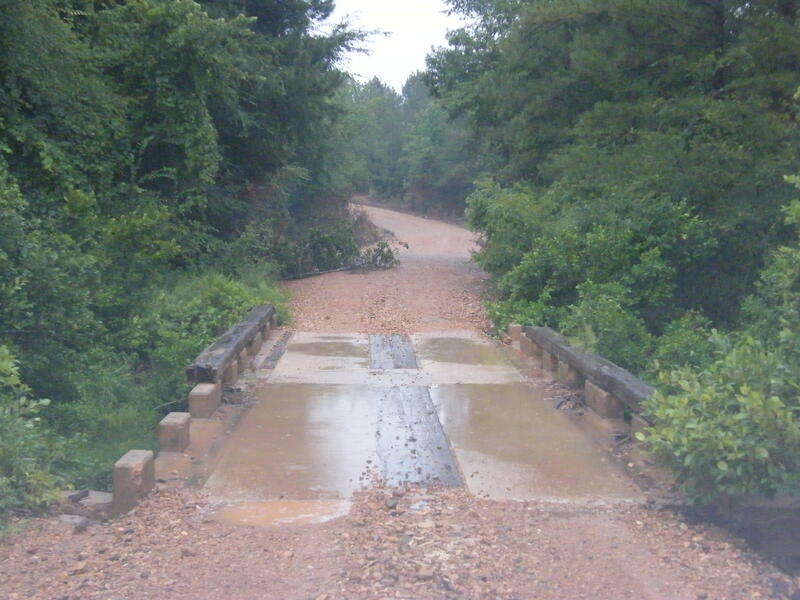 Follow 24000 for 1.4 miles, crossing two short concrete bridges and you will arrive at the Blue Creek bridge. 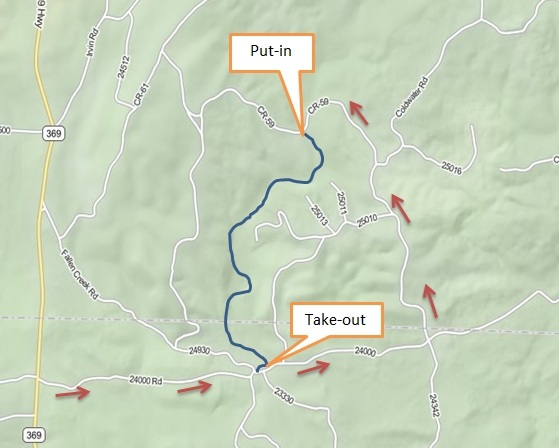 The actual take-out is on river left just upstream of the bridge since it would be extremely difficult to take out in the swift current at the bridge. Park in the intersection just short of the bridge; there is ample room in the central triangle formed by the two roads coming together. Don’t even think of using the handy area just east of the bridge or you will be winching yourself out! Shuttle using 24000 to the east for about 1 mile to a four way intersection; turn left (north) and stay on the main road (it bears right at the single major intersection) and you will arrive at the put-in bridge after about two miles. There is good parking there. A video of the first descent is shown below. The drainage area for the creek is only 1.6 square miles, and the water level falls quickly so this is another creek that is had to catch. 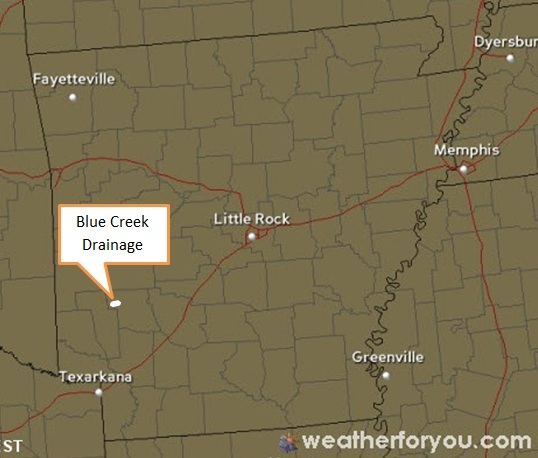 Below is the WeatherForYou.com map (that website is now defunct) showing the drainage area location.